As a traffic safety leader in their province, the team at the City of Saskatoon Sign Shop has continued to impress local city councillors, senior management and fellow City employees with their commitment to safety and innovation. Operations Superintendent and leader of the Sign Shop, Jon Theobald, has played an integral role in transforming their team’s approach to safety. Despite the solid foundation that existed when he arrived, Jon knew there was room for improvement. “Since my promotion into the Sign Shop in 2015, I recognized that we needed to bring our staff, equipment and the overall business into modern times. There was nothing drastically wrong with the way we executed our work, we just needed to embrace a more innovative and forward-thinking approach.” That’s where ATS Traffic came in. 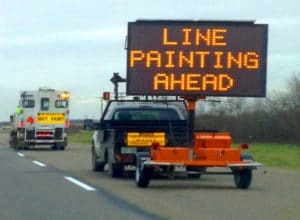 Some examples of collaborative solutions include utilizing Truck- Mounted Message/Arrow Boards to improve safety and warn motorists during closures or line painting projects. Together they’ve come up with some creative approaches for electronic messaging to warn the public while keeping costs low – like towing a message board! 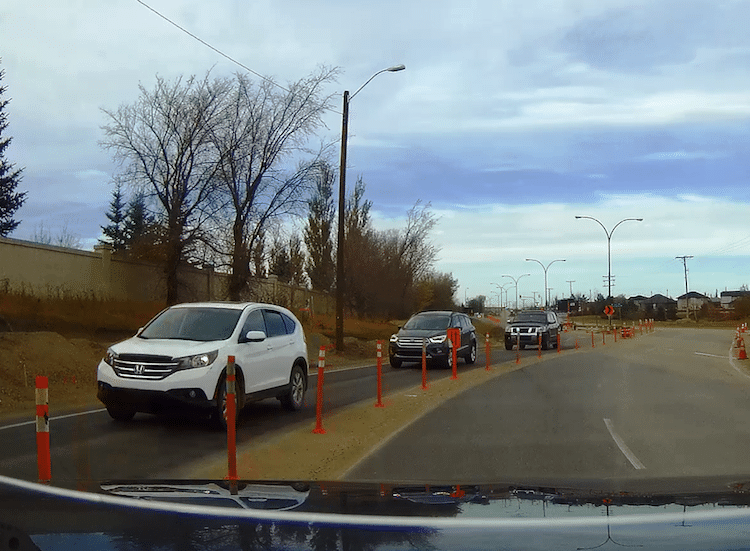 Their use of specialized delineators and high visibility barricades has drastically improved driver compliance and reduced incidents at a particular site where regular impacts were occurring. Not only did their solution improve safety for drivers, but there were significant cost savings for the City and a drastic reduction in risk for staff. The work happening at the City Sign Shop has been producing ripple effects throughout the province. 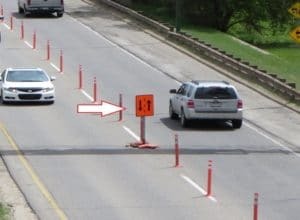 Using Pexco FG300 posts from ATS for a closure on a local freeway, for example was featured on the front page of the supplier’s catalogue as it captured a correct set up, a professional look and effective use of the product. 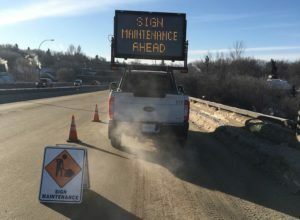 When the TM548 Message Board was used on City pilot trucks for lane closures, the province’s Department of Highways investigated the same product for their own use. Over the years their team has obtained a large fleet of Ver- Mac truck-mounted, arrow and portable message boards. The City of Saskatoon was the first municipality in the province of Saskatchewan to utilize Ver-Mac’s fleet management software JamLogic. 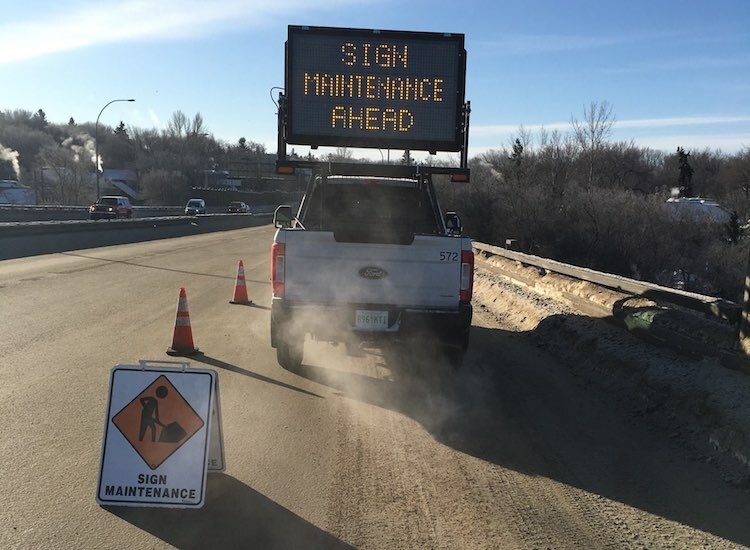 Our team in Saskatoon helped to source a TM548 Truck-mounted Message Sign for the Shop’s pilot trucks to use for lane closures. Using this technology has had a major impact on the bevahiour of motorists when they come upon City staff maintaining the roads. 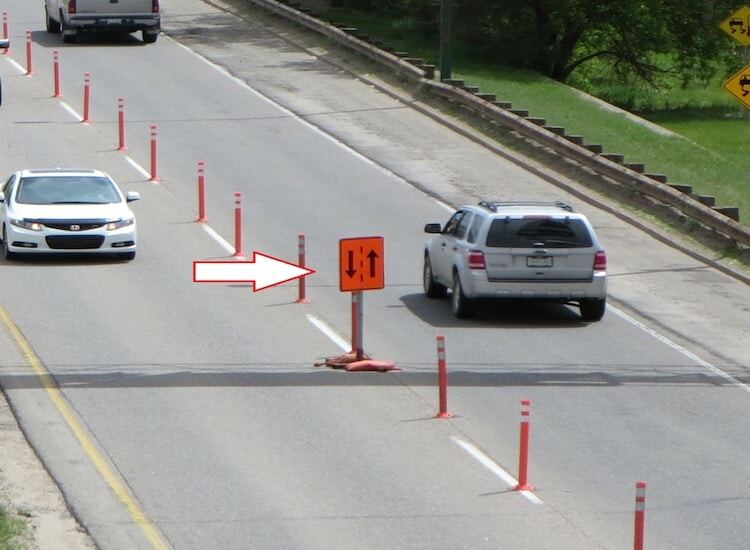 Approximately 900-1000 kilometres of lane, centre, and edge lines are painted annually within Saskatoon. 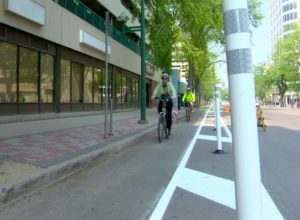 Higher traffic locations are painted 2 to 3 times a year. This means City crews are out on the roads, increasing their own and the public’s risk given their proximity to live traffic. The TM548 was used for the Shop’s line painting truck to warn the public of fresh paint. The unexpected result? Their team increased the volume of their spring lane marking program by 65% because they were able to paint areas that would normally need to be completed at night due to high traffic. As part of the City of Saskatoon protected bike lane pilot project, city crews installed two new dedicated cycling lanes along Fourth Avenue from 19th to 24th Streets in September of 2018. The additions are an extension of the 23rd Street protected bike lanes which the city installed earlier. Pexco posts were also used on several major freeway projects for detours, including set-ups on McOrmond Drive and College Drive. 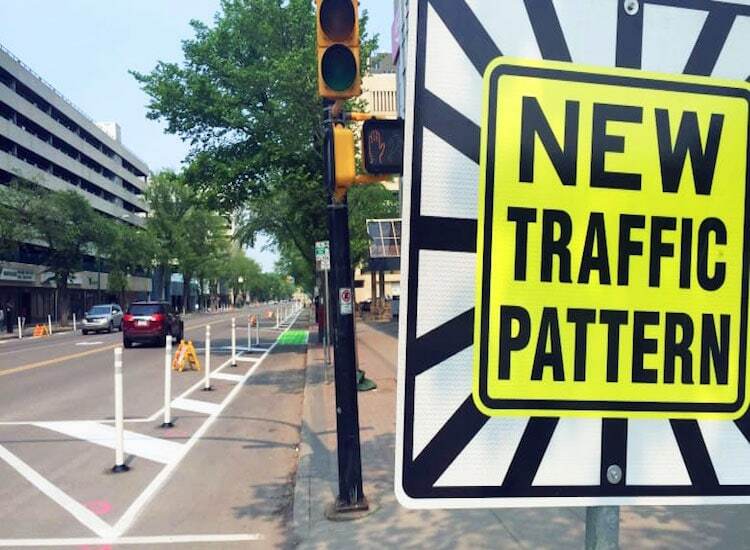 The City of Saskatoon Sign Shop has received consistently positive feedback from the public for the use of new products in detours and set-ups around the city, noting they have been more visible to drivers and more straightforward to follow. Shop staff and contractors alike have commented on the difference some of these products have made, citing a significant improvement in the way the public treats their work zones and the overall increase in safety. Motorists also called in to comment how much more visible the new equipment is. 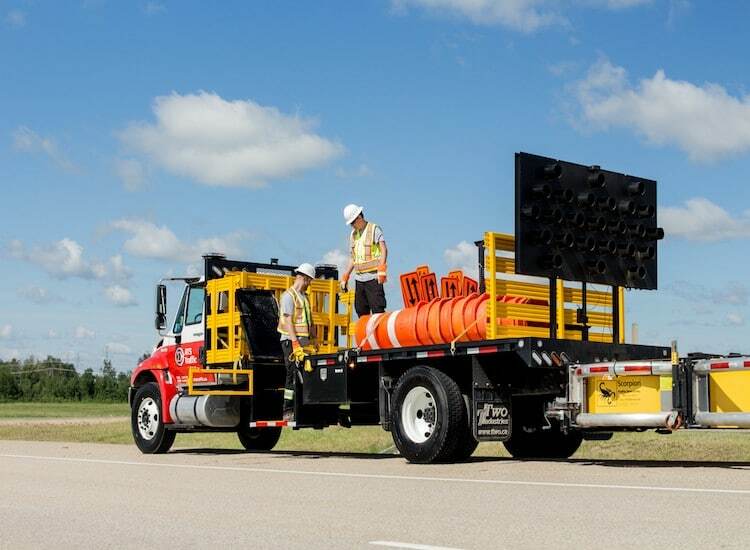 Last Fall, Jon visited ATS Traffic Headquarters in Edmonton to learn more about our Crash Attenuation Truck (pictured above). 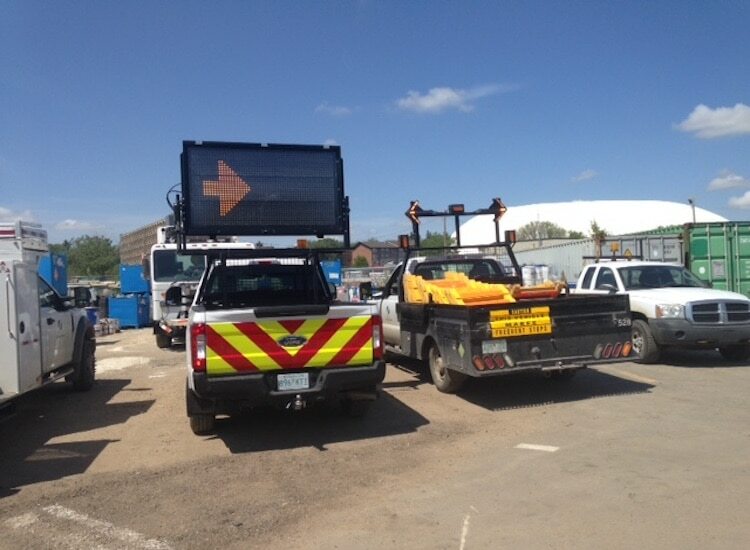 TMAs are mounted behind large trucks or on specially designed trailers to protect vehicles and workers in temporary lane closures. If another driver hits your vehicle, it won’t be damaged, and it won’t crash into your workers. 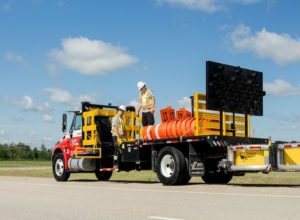 Truck-mounted attenuators work best with heavier vehicles: the truck will roll forward when it’s hit, but the vehicle’s weight will reduce the distance. Up next: Jon and his team will be collaborating with ATS Traffic on a redesign of the City’s detour truck to allow the team to place traffic devices from the back of the vehicle. So far, they’ve gathered safety regulation information from provinces across the county, spoke with police traffic officers and put in a request for an exemption from the Ministry of Labor. Together, they plan to design and build a superior detour vehicle that has yet to be seen on North American roads. “As traffic safety leaders, I feel it is our duty to consistently revise the way we do business and look for product advancements and designs that ensure the safety of everyone on our roadways. 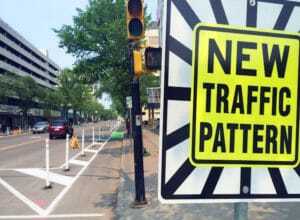 We must evaluate our traffic management practices for planning and implementation to protect everyone from the folks working in construction zones to the motorists traveling through our city.